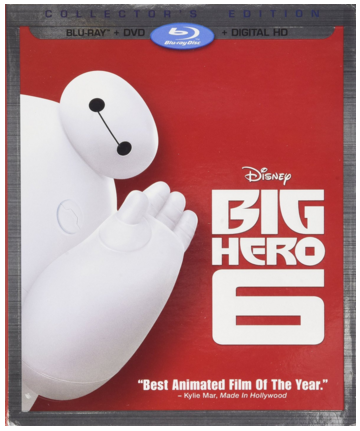 Big Hero 6 (Blu-ray + DVD + Digital HD) Just $15 Down From $40! You are here: Home / Great Deals / Amazon Deals / Big Hero 6 (Blu-ray + DVD + Digital HD) Just $15 Down From $40! Head over to Amazon and score this great deal on Big Hero 6 (Blu-ray + DVD + Digital HD) for just $15 down from $40! Get yours now while it lasts! With all the heart and humor audiences expect from Walt Disney Animation Studios, BIG HERO 6 is an action-packed comedy adventure that introduces Baymax, a lovable, personal companion robot, who forms a special bond with robotics prodigy Hiro Hamada. When a devastating turn of events catapults them into the midst of a dangerous plot unfolding in the streets of San Fransokyo, Hiro turns to Baymax and his diverse group of friends — adrenaline junky Go Go Tomago, neatnik Wasabi, chemistry whiz Honey Lemon and fanboy Fred — who transform into a band of unlikely heroes. Bring home Disney’s BIG HERO 6, featuring comic-book-style action and hilarious, unforgettable characters — it’s fun for the whole family!